When Christina hit me up about two weeks before her wedding day to inquire about a Palm Springs Wedding Photographer to document her intimate elopement in the desert I thought, “Damn this sounds awesome and I hope we can make it happen”. The first potential road block was that I stop shooting weddings in Palm Springs at the end of May because…well…it gets too damn hot out there. I literally photographed a wedding at the Monkey Tree Hotel at the beginning of May and I about passed out from working in the 104 degree heat with dress clothes on. The other issue was that May is peak wedding season so I did not have much confidence that I would even have Christina’s wedding day available. Then out of nowhere all the stars aligned in the most perfect way for all of us. Christina opted to have her wedding on a Friday, which was the one day that I had available that week, and the temperature dropped from the mid 100s to the high 80s on her wedding day. Perfect timing and weather to close out my Palm Springs area weddings until the end of Summer. BOOM! From that moment we were all set to rock and roll in Palm Springs! 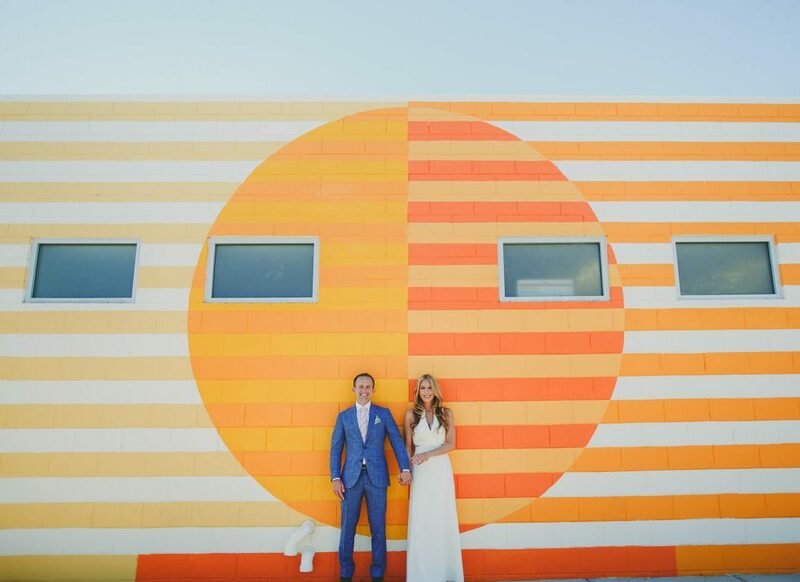 Christina and JJ stayed at Ace Hotel Swim Club, one of my personal favorite spots in Palm Springs, and wanted to take a few photographs at that location before moving out near the Palm Springs Visitor’s Center for their elopement. Honestly, the there is nothing really special about the Palm Springs Visitor’s Center other than maybe the cool retro design of the roof, but the spot is very easy to find since it is right off Palm Canyon Drive. The Palm Springs Visitor’s Center also has a lot of available parking, quick access to the desert, a gorgeous backdrop of the San Jacinto mountains and a semi-cheesy sign that says “Palm Springs” that lets any drifters know what town they are in. Once at the Palm Springs Visitor’s Center, the private ceremony took place with only a very small group of family. The scene was very emotional, only momentarily being broken up by JJ’s stellar impersonation of Barack Obama. Even though the wedding coverage this day was short, the authenticity was amazing, and the bride and groom were seriously perfect. All I can say is it was a good day, and that has nothing to do with the IPAs JJ hooked me up with after the wedding! Below are some of the photographs from our 3 hours together! Cheers! Those interested in viewing more desert weddings in Palm Springs can check out a recent elopement at Ace Hotel I photographed a couple months ago, or these wedding photos at Casa De Monte Vista with Adel and Dev! I can not encourage people enough to consider moving away from the big traditional wedding and instead opting for a intimate private ceremony/elopement. The top benefit is that you save a ton of cash, but also it puts the focus on where it should be which is on you and your significant other. And besides you can still have an epic reception at another date, time and place to get your party on! Don’t be scared to do something different. Seriously. This is your wedding and you should not feel stressed or overwhelmed by any of it! Cheers!